Chicken is a universally-liked meat, making it a safe bet to feed most people. It is usually inexpensive, and when grilled right, it can taste amazing! We are going to give you some tips for helping you achieve the best chicken next time you grill out! The first thing you need to do is to pick the cut of chicken that you will be grilling. You need to consider the amount of time you have to cook it, since the larger the piece of meat, the longer it takes. If you are using boneless chicken then we would suggest pounding the meat. The reason you do this is to try to make the meat as even as possible in terms of thickness. This will help the entire amount of chicken cook at the same speed. Adding flavor to chicken is something you probably will want to do since unseasoned chicken can be a bit dry and bland. Injecting flavor into the meat can add a ton of amazing complexity and help your chicken taste like a million bucks. You can also use rubs, marinades, or use a sauce after the chicken is grilled. One of the best parts about chicken is that it can go with almost anything. Clean your grill before putting the chicken on the grill. Add oil to the grate to prevent the chicken from sticking. Chicken is not like burgers or steak which generally are cooked on high heat. Instead, you will want to use a lower heat. Chicken skin cooks quite quickly, and if cooked on high heat, it will result in a raw chicken with burnt skin. Indirect heat is ideal and if you BBQ a large amount of chicken, then a pellet grill is a perfect option since it uses indirect heat to cook. Novice grillers are the most likely to make the mistake of leaving the grill open, or at least not leaving it closed for long. This loses a lot of heat and can make the food take longer to cook. As we said above, chicken needs to have heat cooking it from all directions not just from below. So keep that lid closed for the best results. 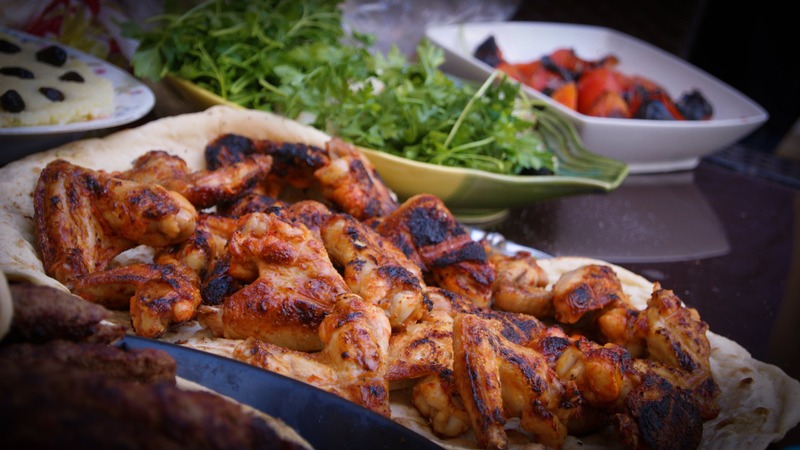 Once your grill is cooking, carefully clean the area that has been touched by the raw chicken. If you are using a BBQ sauce for your chicken, then wait to apply it until the end. The sauce cooking on the chicken will achieve an amazing caramelization on the meat. This will make your chicken taste amazing! It is helpful to use a digital thermometer to check the meat. Ideally chicken should be cooked to an even 165º or higher. You should put the tip of the thermometer into the thickest part of the cut of meat since that will be the coolest part of the chicken. Don’t let the thermometer touch bone, since this could read a different temperature. We hope these tips make your chicken taste even better or make the process simpler for you! If you need any of the accessories or a good BBQ sauce, check out our store!